U.S. Navy and Japan Maritime Self-Defense Force units are scheduled to begin MCMEX 2JA, an annual mine countermeasures exercise, July 17. 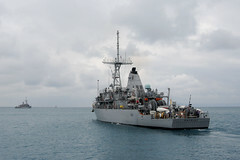 The U.S. 7th Fleet will rotationally deploy two P-8A Poseidon maritime patrol aircraft to Singapore from July 15 through Aug. 12 in support of shared maritime security initiatives. 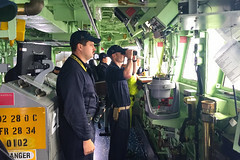 The mine countermeasures ship arrived in Hakodate, Japan, July 14 for a port visit before the crew makes its way to an annual mine countermeasures exercise with the Japan Maritime Self-Defense Force. 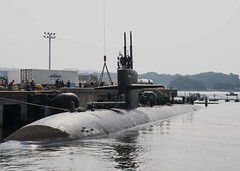 The Los Angeles-class attack submarine USS Key West (SSN 722) arrived at Fleet Activities Yokosuka, July 12, for a routine visit during ongoing operations in the Western Pacific. 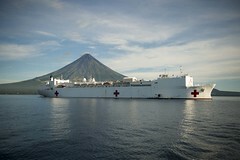 After two weeks of activities building disaster response capabilities and strengthening relationships, the multinational Pacific Partnership team departed the Philippines, July 11. The guided-missile destroyer arrived at Naval Station Everett, Wash., July 9, completing a homeport shift from San Diego. 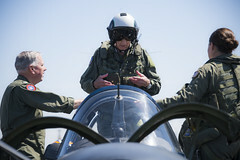 Legendary ace flies his 100th aircraft above the "birthplace of naval aviation"
A 95-year-old, 29 1/2-year veteran famous for being the single-known ace to achieve victories against both German and Japanese aircraft during WWII, flew his 100th aircraft July 9. 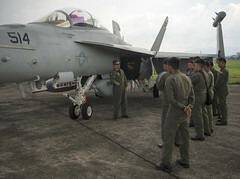 A detachment of Electronic Attack Squadron (VAQ) 138 recently completed training alongside the Armed Forces of the Philippines for routine operational missions that enhance regional maritime domain awareness. 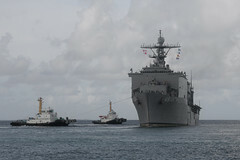 The dock landing ship returned to Sasebo, Japan, July 8, after completing several phases of the Cooperation Afloat Readiness and Training (CARAT) exercise series. A joint disaster symposium at a hospital in Legazpi, Philippines, gave the Pacific Partnership mission team and local medical personnel the chance to have an open dialogue about disaster management relief, in a medical context.